A 15-5-10 Blend with six added nutrients (Magnesium, Sulfur, Copper, Iron, Manganese and Zinc), K-8 is perfect for St. Augustine, Bermuda, Blue Grass, Buffalo and other lawn grasses. Apply a 40 lb. 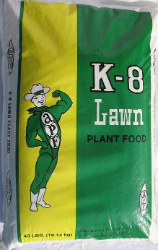 bag of K-8 per 5,000 square feet of lawn. Use it early in the spring when grass first starts to green, and repeat throughout the summer months if grass starts to lose green appearance. Fall applications are also recommended. Do not apply to wet grass. Water soon after fertilizing.